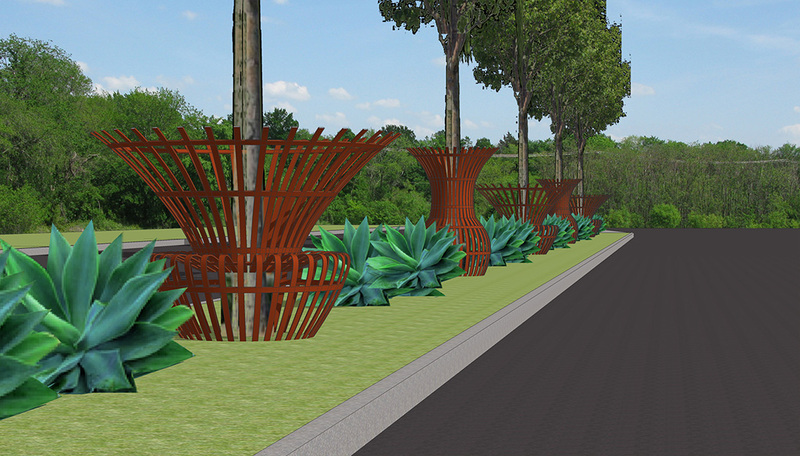 Our concept enhances the northern segment of the Tezel Road, from Timber Path to Guilbeau Road. Six, twelve-foot wide, medians define the character of this stretch of road. As the dominant expression of neighborhood identity, they provide an opportunity for increased awareness of place. 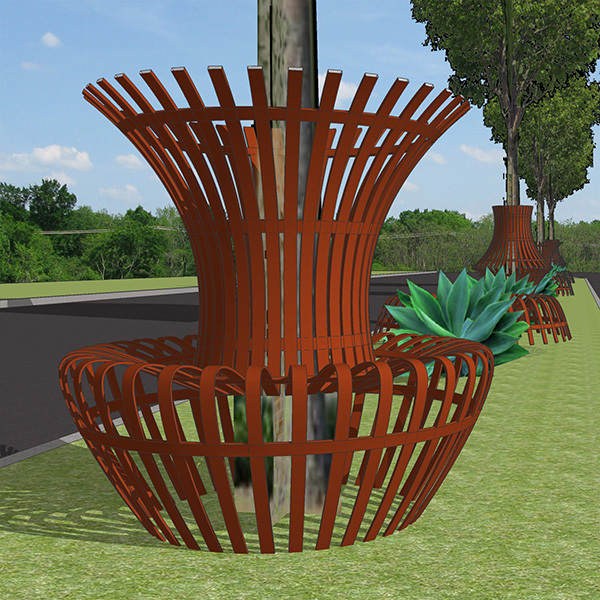 We propose adding a series of tree guards for the tall trees along all the medians. 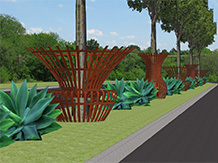 Their forms, created as a family of shapes, recall classical garden ornaments, pots and vessels; connecting the residential and commercial neighborhoods along the arterial with the streetscape, adding personality and touch. Each median presents a unique but related pattern of vessels, mixed with small and large ornaments, providing contrasting heights and forms. 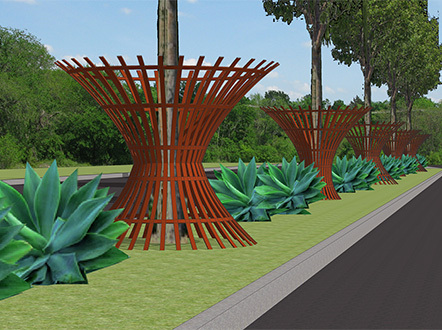 This patterning system unifies the streetscape, suggesting a community garden, potentially creating a new symbol of identity for Tezel Road. 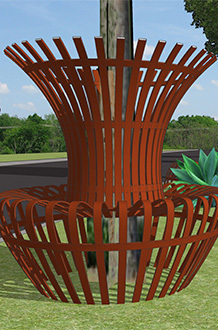 The weathering steel vessels project above the plane of native grasses, marking and celebrating the trees. Their familiar shapes reinforce neighborhood identity and cosnnection with landscape. Driving by, the sequence and cadence of the shapes create a pleasing rhythm. Their durability, easy maintenance, classical yet contemporary design, and street scale make them an appropriate choice for this site. 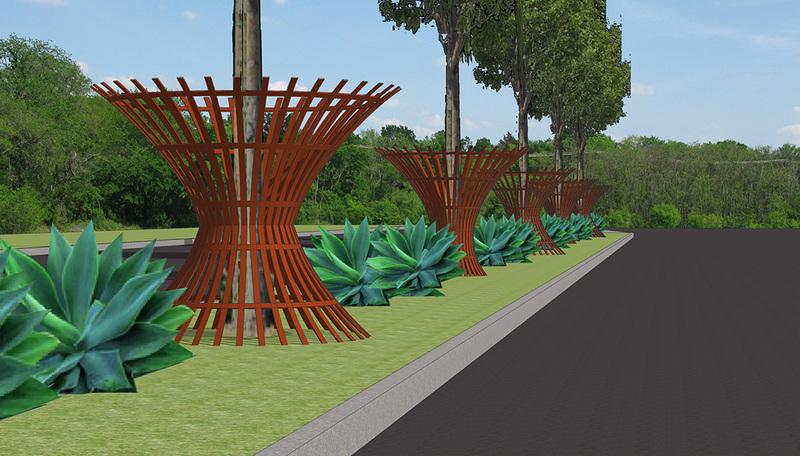 They will become a timeless expression of neighborhood identity, enduring over generations.